We develop and support large-scale online stores, starting from wireframes & design and up to delivery and maintenance. From a few products up to millions with hundreds of thousands of daily visits. Products, Orders and Customers Managment backends, online stores, including desktop and mobile versions, shipping calculation and payment gateways integration, as well as mobile apps for iOS and Android platforms - we provide full-cycle services to our customers. Planning, development and integration of web-based ERP and CRM systems, tailored for specific business needs is our specialization. We have experience with many industries, such as Production, Retail, Travel, Finance, Education and many more. We provide hosting services for our projects, as well as configuration, deployment, monitoring and scaling on virtualized and cloud infrastructure, delivering up to 99.9% uptime SLA when downtime is not an option. Our customers stay with us for years, as we put every possible effort into making sure that our technologies provide the most business value per dollar. Industry leaders choose us as their web development partner. We're proud to provide services to companies, recognized internationally as the Internet Retailer Top 500 Members or Loyalty Awards Winner, as well as the Baltic market largest businesses, such as Online Stores, the First Online Auction of Art & Antiques, Travel Agencies and others. We strive to deliver business value in small increments, working closely with our customers. The changes are always welcome, at any stage of the project. In order to deliver results fast, we automate whatever can be automated. Starting from project creation and up to running the tests, servers configuration and deploying the projects - everything happens with a click of button. We review and adjust our processes regularly on all levels, starting from the team retrospectives and up to high-level company direction and goals. We utilize industry best tools to deliver best value for our customers, as well as to keep our employees happy. Powerful hardware, best in class development environments, great work condition - this is what allows us to focus on results. We're proud to employ the best industry professionals. As an agile company, we keep management roles to the minimum. We rely on process improvement, rather than direct management. We employ over 25 professional software developers with different speciality, such as Back-end, Front-end, Database, DevOps and of course Quality Assurance. 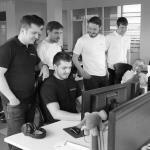 Our developers are organized into cross-functional teams of 4-7 people. A professional Product Owner and a Scrum Master is assigned to every team. For the past few years we have tripled the size of the team. Check the list of positions on Careers page! We utilize modern technologies, mostly open-source. We avoid reinventing the wheels, that's why instead of writing our own tools, we often contribute to the existing open-source projects. We base most of our projects on Symfony framework. We're actively contributing to Symfony ecosystem, including Composer, SonataAdminBundle, LiipImagineBundle, RabbitMqBundle, FOSRestBundle and many more. For selected projects we also use Node.js as the backend. RabbitMQ is our current choice for messaging and asynchronous data processing. For creating desktop, mobile and responsive website frontends, we utilize various modern technologies and tools, such as React, LESS, Webpack to name a few. Our main relational databases are MySQL and MS SQL Server. We also work a lot with Elasticsearch as a search, document database and data aggregation engine. We also use Apache Cassandra and MongoDB as our NoSQL engines. We use both Puppet and Chef for infrastructure automation. Most of our infrastructure is virtualized. We use VMWare for private clouds and XEN or KVM on cloud providers. We invest a lot into monitoring and alerting, using time-proven tools, such as Nagios & Munin. Logstash/Kibana and Splunk are used for logs processing and analysis. For internal operations we rely on Atlassian product family, including Jira, Confluence, Stash and Bamboo for builds and deployments.